In the mail yesterday we received news from our newborn child, Maria. Well not exactly from Maria, it was more from the "adoption agency" of sorts. Remember when you didn't like your siblings so for their birthdays your parents had to pick out a gift and put your name on it to make you look nice? You didn't want to get a gift for them, so they had to force it on you. No? Okay, maybe that's just in my family. Regardless. That happened to us this time. But not with our siblings, rather with our adopted daughter. In response to our lack of letter or gift sending, we received a letter in the mail. The letter stated that Maria had been sad because we had not yet written her. 8 month old Maria was sad. She was so distraught that they were sending us an activity and all we had to do was put it in an envelope and mail it to Maria. And we were to forward the map on to Maria so she could play with it, along with the enclosed stickers. 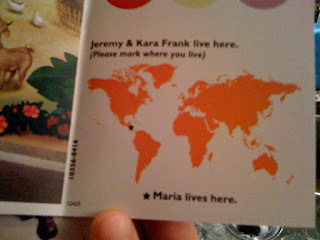 We were told to mark where we live, and they had marked where Maria lived on the map. So, I have an 8 month old niece, and, as bright as she is, if you gave her stickers, she would try to eat them. I'm going to go out on a limb here and say that if we sent maria the enclosed map and stickers, she would likely do the same. I'm just guessing that Maria would prefer something along the lines of smashed peas to stickers of people working out. Again, just a thought I had. 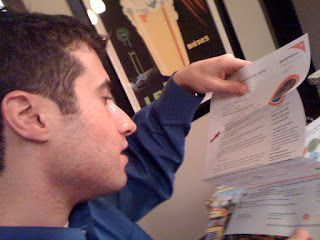 While I held the map, looking at it, guilt building, I turned to Jeremy and said I thought we should send it to Maria. Jeremy: "Kara, it is significantly possible that Maria does not exist. And if she does exist, she is likely 18 years old. 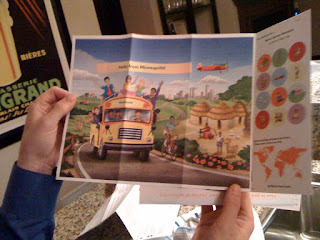 And if she does exist, and by some miracle this map does reach her, I'm thinking there are things she would rather have than a map and stickers"
I still think we should go on a mission to find Maria. After all, she is our baby. Maria Mendoza Frank. Who wants to go on a manhunt?! Maria Mendoza Frank, your auntie Abby is looking forward to meeting you!